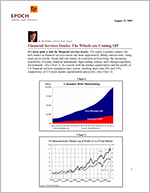 Financial Services Stocks: The Wheels are Coming Off - Epoch Investment Partners, Inc.
Now, however, the winds are shifting. The decades-long bull market for bonds appears to have ended in 2003, when the 10 year US Treasury note yield bottomed out at 3.11%. Since June of 2004, the Fed has raised short term rates to 3.50% from 1.00%, and has given no indication that it will stop these rate increases anytime soon. The benign regulatory environment has given way to aggressive legal and regulatory enforcement by state and federal agencies. Thanks to the alchemy of securitization and the apparent abandonment of lending standards, borrowing continues to increase, keeping asset prices elevated, but causing systemic risk to grow exponentially. The mammoth amount of leverage in our current system could result in a financial meltdown that could damage the entire U.S. economy, with potential harm to international markets, as well. If this meltdown occurs, the financial services industry will be “ground zero”. Financial services stocks are particularly vulnerable to rising short- and long-term interest rates and a flattening yield curve. Increasing short-term rates are putting pressure on the cost of funds for financial services companies. (See Chart 3) These higher short-term rates could also result in an economic slowdown, which could threaten asset portfolios created by lax lending standards. Long-term rates also have the potential to rise, threatening the value of securities portfolios and damaging the collateral behind high loan-to-value real estate portfolios. Meanwhile, the flattening yield curve is squeezing net interest margins for financial services companies, and the long bull market for bonds has resulted in increased capacity, which has heightened competition and placed additional strain on lending spreads and underwriting standards. Creative lending instruments, such as option ARMs, have only exacerbated the problem. Bank accounting for option ARMs is emblematic of the industry’s poor earnings quality, poor disclosure and lax lending standards. Option ARMs are adjustable rate mortgages that let borrowers choose how much to pay each month and are now frequently being used by lenders to qualify otherwise unqualified borrowers. Each month, the bank books the total amount of the required payment, not the minimum amount that is actually paid, thus creating non-cash earnings. The unpaid interest gets tacked on to the outstanding principal amount of the loan, allowing the bank to show loan growth. Recently, Golden West Financial one of the best managed financial institutions disclosed that option ARMs contributed 10% of net interest income in its second quarter. It is likely that option ARMs are making an even greater contribution to the earnings of institutions run by less well-regarded management. Inadequate equity support for portfolios and the dynamics of securitization also pose potential threats. Huge loan, securities and derivative portfolios cannot be adequately analyzed and are supported by only a tiny sliver of equity. (See Chart 4) For example, it is estimated that the notional value of J. P. Morgan’s derivative portfolio is $42 Trillion. Its equity is $106 Billion. Its tangible equity is $57 Billion. Securitization, which has contributed greatly to the abandonment of lending standards, is the financial services version of “musical chairs” (See Chart 5) It works until the music stops. When the music stops due to rising interest rates and/or a slowing economy, we’ll find out which financial institution doesn’t have a seat. As a result, financial services stocks will be crippled by their unreliable accounting methods and increasingly dangerous investment profiles. There is ample anecdotal evidence that loan quality is deteriorating rapidly given the surge in volume of creative lending instruments such as option ARMs, silent seconds, interest only and zero down loans. (See Charts 6 & 7) However, financial institutions continue to run down loss reserves and then add these loss reserves to earnings. In a regulatory Catch-22, banks must only book reserves based on recent loss history. Given the relatively favorable economy, and the incredibly easy access to credit and rising asset prices (caused by the credit excesses), defaults have been very low: perhaps artificially low. In the not too distant future, the combined effects of these untested creative lending instruments could place financial institutions in a “perfect storm” of low loss reserves, rising defaults and falling collateral values. Loss reserves will have to be rebuilt and falling collateral values will have to be written down through charges to earnings. In addition, trading profits and securities gains have become increasingly important to financial services firms as ways to boost the bottom-line. Not only are these benefits non-recurring, but they will also be much tougher to come by in a flat-to-rising rate environment. The increasingly strict regulatory climate will pose an additional challenge for financial services stocks going forward. Elliott Spitzer and Armando Falcon of OFHEO (who reined in both Fannie Mae and Freddie Mac) are only the beginning. The extent to which increasingly rigorous financial service regulation will inhibit growth and profit depends upon the magnitude of the fall-out from the inevitable bursting of the real estate bubble. All signs point to a very hard landing and a very tough regulatory backlash. In the financial services industry, one can foresee a particularly dangerous scenario. For the past several years, over-indebted consumers have been induced to borrow far beyond their ability due to the availability of exotic financial instruments. These instruments have been created by earnings-driven, bonus seeking financial services executives who securitize these loans, and add to systemic risk. When the housing bubble bursts, the dangerous and unsustainable nature of this process will be immediately exposed. It’s not hard to imagine a string of financial executive “frog marches” and “perp walks” being exploited by politicians to both set an example for other executives, and to provide a convenient spring board for higher office. It’s also not hard to imagine the implementation of much stricter lending regulations, which will likely worsen the effects of the bust, and severely crimp future earnings power and profit growth in the financial services industry.